French Lessons by SkypeLearn from great teachers… anywhere in the world! If within 120 (one hundred twenty) days of your purchase you are not satisfied that the product that you have bought improves your French language skills, we will refund you 100% of the purchase price. These clean French Jokes and puns come with audio recording and English translation. A fun practice for the whole family! As a last resort, read the English translation. Then listen to the audio again. Make sure your make French flashcards to memorise the new vocabulary. – Et ton frère ? – What are you doing? 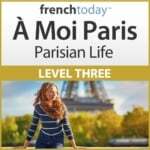 À Moi Paris Level 3 "Parisian Life"
Un enfant va avec son père à l’hôpital pour voir sa mère qui a accouchée. Quand ils arrivent, l’enfant remarque que son petit frère a un bracelet autour de la main. – “Papa! Papa ! Ils ont oublié d’enlever le prix!!! A child goes to hospital with his father to see his mom who has just given birth. When they arrive, the child notices that his little brother has a strap around his hand. – On ne sait pas, il ne parle pas encore! – We don’t know; he doesn’t talk yet! I am doing my PhD in Comparative Literature at the University of Alberta. In my research I use three languages: Farsi, English, and French. The first is my mother tongue, and the second has been the language of instruction in my studies during the past decade. As for French, I dare to say that my familiarity with Camille’s great French audio lessons has been a turning point in my relationship with this language. Thanks Camille!